The South Cotswold hill village of Far Oakridge, along with the neighbouring villages of Oakridge, Oakridge Lynch, Chalford and Bisley became, in the late nineteenth and early twentieth centuries, a thriving centre of what is known as the ‘Arts and Crafts Movement’. Here major figures in that movement such as Edward Barnsley, Ernest Gimson, and Alfred Bucknall worked – designing and producing furniture and metalwork now highly prized and well represented in the nationally designated Museum of the Arts & Crafts Movement at nearby Cheltenham Art Gallery. In that gallery, along with fine examples of Arts & Crafts furniture and metalwork, are works by painters associated with the movement. One of the most imposing of such paintings is this work by Sir William Rothenstein – a significant figure in British art of the early twentieth century who trained generations of artists at the Royal College of Art. He was the father of John Rothenstein, Director of the Tate Gallery, and of Michael Rothenstein an important painter and printmaker of the second half of the twentieth century. From a Bradford family William was always drawn to hill country – from the Pennines and Dales of Yorkshire to the rugged hillsides of the South Cotswolds. His paintings of the aftermath of World War 1, its battlefields, are extremely powerful. For him Far Oakridge was bliss – and he enjoyed the company of the Arts & Crafts members and employed them, and local craftsmen they worked with, to renovate an old and somewhat derelict Gloucestershire farm – Iles farm. This work is typical of his gritty and firm approach to painting – both in subject matter and technique. Trained at the Slade School and in Paris, where he met, amongst others, Degas, his approach is in firm basic drawing and composition. 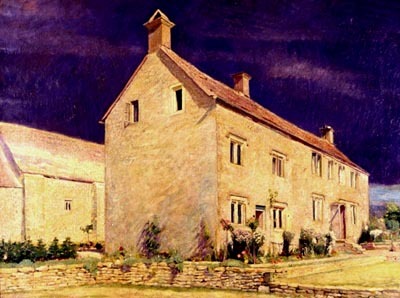 His painting technique uses ‘short’ paint and mainly flat brushes – common amongst his Slade generation and influenced by Degas – giving a very tactile finish admirably suited for capturing the essence of stone buildings. He later became Head of the Royal College of Art, raising its status as a major training ground for artists and art lecturers to the very highest level.